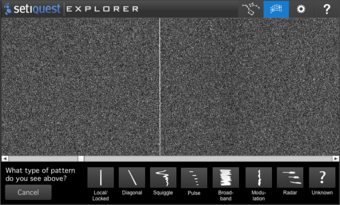 setiQuest Explorer is a web and mobile application for viewing radio telescope data from SETI targets and helping to identify and categorize patterns. Based on Adobe Flash, it runs in your web browser and on Android devices. The setiQuest Explorer app was developed by Francis Potter and The Hathersage Group with funding from Adobe System's Experience Design Group. The app was built with the Adobe Integrated Runtime (AIR) environment. The server technology is Ruby on Rails. The private beta was launched on March 10th 2011. and the public interest was very strong. Within 4 days of the announcement more than 1500 beta tester volunteers have registered. The server software infrastructure and database have been ported to AWS in anticipation of extending the beta in Q3 2011.
setiQuest Explorer combines Google Sky with a Waterfall plot where users scroll through the entire signal bandwidth searching for signals. Any patterns found by users get tagged, categorized, and submitted to a database for further analysis. The eventual goal was to create the real-time streaming infrastructure and have enough app users to be able to analyze live data within 4 minutes. March 1 2011 - Jill Tarter demoed the setiQuest Explorer app at the TED 2011 event. March 10 2011 - Private beta launch of setiQuest Explorer. March 14 2011 - An overwhelming 1500 users registered for the beta. Most were put on hold. March 22 2011 - 2300 users have registered for the beta. Only 300 have been accepted. July 28 2011 - Avinash Agrawal and Francis Potter presented setiQuest Explorer at the OSCON 2011 convention. July 31 2011 - setiQuest Explorer leaves beta? Registration problems persist for some into August and September. August 9 2011 - An open source setiQuest Explorer HTML5 port project was started by two software engineers at NASA Goddard. It planned to utilize HTML5 instead of Flash so that it could run on iOS and on any modern web browser. The ETA was Spring 2012. October 4 2011 - The intern help of a USC undergrad is requested. January 11 2012 - User:Jrseti meets with Francis Potter to discuss the future of setiQuest Explorer. January 17 2012 - The decision was announced that setiQuest Explorer had been "discontinued." April 10th 2012 - The steps for an orderly shutdown were discussed. May 31 2012 - Francis Potter sent out the shutdown email to everyone who signed up for setiQuest Explorer. Android 2.2 or a web browser with Flash Player 10.2. Network bandwidth. Each assignment downloads 20 MB of data. Preliminary analysis of the setiQuest Explorer results was performed by a student from the Armagh Observatory in the UK. Lessons learned from setiQuest Explorer were incorporated into the SETI Live project. Thanks for signing up for setiQuest Explorer! It's been an exciting year. setiQuest Explorer was an collaborative project of the SETI Institute, Adobe Systems, and The Hathersage Group. It was the first attempt at interactive citizen science around SETI radio telescope data, and it was a resounding success. Over 10,000 of you signed up, and identified over 14,000 interesting patterns in the radio telescope data. However, we will be shutting it down this week. "We eventually analyzed that same data with our automated detection system called SonATA and compared the results against what you found. We used that information to study how often you marked the same signals and classified them the same way, and how often you marked what SonATA classified as noise-only based on statistics, i.e. where SonATA didn't find anything." The SETI Institute also used learnings from Explorer to develop a new citizen science application in collaboration with TED, the Science Channel, and Zooniverse. The new system is SETILive. "We decided to ask volunteers to help us look in regions of the spectrum where SonATA find lots of signals and cannot get them all classified in the time available. 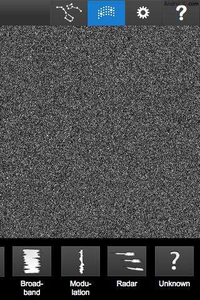 Historically, SETI searches have ignored these crowed bands that are filled with our own communications technology -- signals we refer to as RFI (radio frequency interference).But these are precisely the frequencies at which a nearby ETI would notice that the Earth is loud, and where they would know we'd have receivers to detect any signals they sent back. For more distant ETI, these bands are as viable as any other bands within the 1 to 10 GHz terrestrial microwave window, so why should we give them up? Maybe there's no option until we can afford to throw a lot more complex signal processing resources into the process -- a whole lot more. Or maybe the superior pattern recognition capability of the human eye and brain can figure out how to sort through all of our technology to see if there's any residual patterns that might not be our RFI, but might be from another, alien technology." "Since you helped us out before, perhaps you'd like to do so again. What is available on line right now is a primitive first cut at the necessary tools. You can help the Zooniverse team make them better. When the browser-based platform becomes more elegant and stable, we plan to allow development of mobile applications." Thanks again for all your feedback and help with setiQuest Explorer. Go to http://www.setilive.org now to get started!